Last night Keith and I hosted a birthday party for two friends who just happen to have birthdays in the same week. There was lots and lots of yummy food, tortellini soup, cupcakes, baked brie with honey and pecans, pulled pork BBQ…..the girls in charge of the menu went all out! But one of the snacks was such a cute idea that I had to pass it along to you. My sweet friend Holli had offered to bring stuff for s’mores, which in MY thought process means grabbing a box of graham crackers and a bag of marshmallows and a few Hershey’s bars at the checkout- line on my way to the party. Holli however went all out. She made individual s’mores “kits” and put them all in a cute wicker basket to pass around the campfire. Before she headed out the door, I made sure to secure permission to post her cute creations on the blog and she was gracious enough to let me! *1 box NON-ZIPLOCKING, FOLD-TOP sandwich bags such as these. *small paper tags such as these. *in each sandwich bag, place 1 marshmallow, 1 individually wrapped chocolate bar, and 1/2 of a graham cracker. *choose a number, monogram, or graphic to decorate the tags, then tie one on to the ribbon of each packet. *place all the s’mores packets into a basket and serve around the campfire! Because both the birthday boy and girl were turning 32, Holli chose to put the number 32 on each tag. However, this would be a great way to customize the project to fit your own occasion. You could easily use the initial of the birthday person, date (birthdate, due date, anniversary, etc. ), some sort of cute picture (such as a pink or blue image for a baby shower), a holiday clip art, or even your favorite sports team logo for a fall tailgate! The sky is totally the limit as far as labels are concerned. And these cute favors are obviously adaptable to a variety of situations. I hope you enjoy these around your next campfire as much as we did last night! And speaking of campfires…..we have a guest blog in the works that might inspire you to put together some s’mores kits and head out to the woods! Stay tuned! 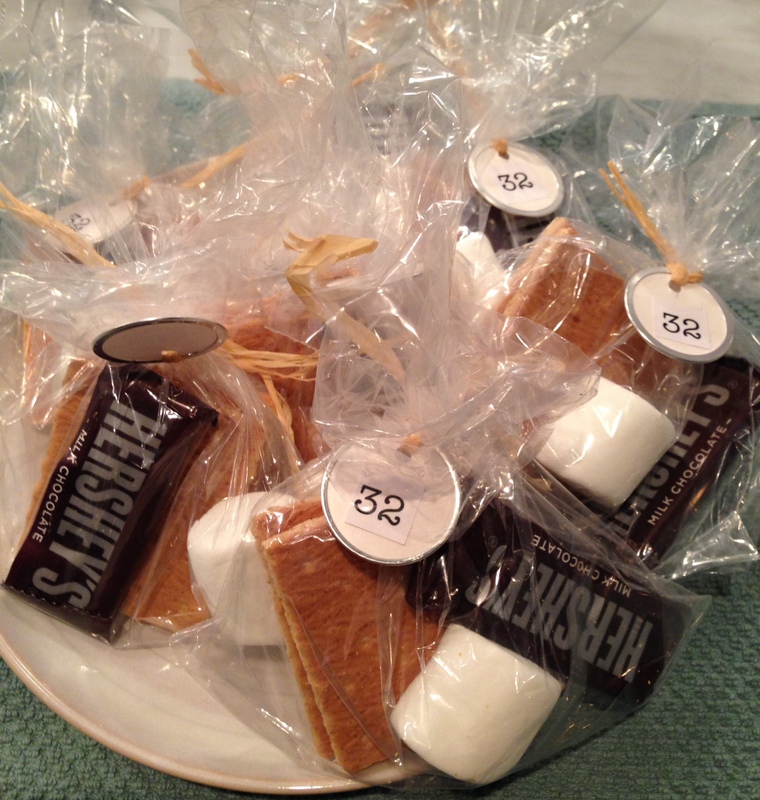 Individual s’mores kits by Holli! So yummy and so cute!